At around 2:29, I spy a KUMOYUNI82-800 Yokosuka Color. Didn't realize these things were still around. Wow, those were taken out of service quickly. They must be satisfied with the test runs and confident in the new model if the old ones are already being scrapped. By March 2018, all Super Azusa services will be operated by E353 series trains, and over the following two years, the E257 series trainsets used on Azusa and Kaiji services are also scheduled to be replaced by E353 series trains. 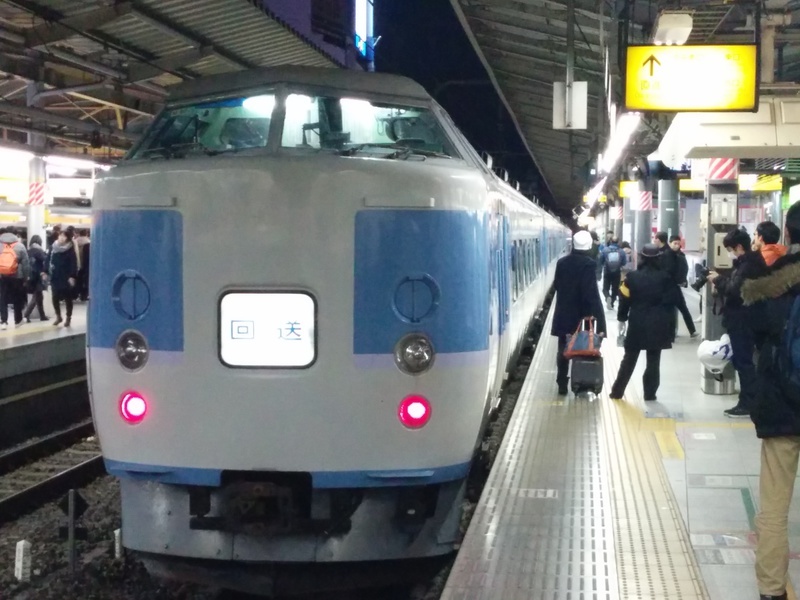 Clicking through to the sankei.com reference, it looks like the E257s will be moved over to Odoriko service. I wonder if they'll get a new livery. Yep, the E353 series will take over services on all Kaiji, Azusa and Super Azusa services. Considering that the few remaining 183/189 series formations probably don't have much time left either, the Chuo Main Line is going to see a lot less rolling stock variation in the near future than it does now. The moving of E257s to Odoriko services is new to me, but makes a lot of sense because replacement of the ageing 185 series was to be expected sooner or later. The E257s aren't that old yet, so they should last quite a few years more. Pity about the impending lack of variation, OTOH the E257s are noticeably less comfortable on the mountainous sections compared to the E351s. If they're going to replace both the E257 and E351 on the Chūō Main Line limited express services, does that mean by 2019 we will see the E353 travel on the JR East portion Ōito Line all the way to Minami-Otari Station, the dividing point between JR East and JR West operations on the Ōito Line? and by freaky coincidence it literally just went past while I was waiting for a Chuo line train to depart Mitaka. Will see if I can hunt it down. I think the 185's will stay around because they'll likely be used primarily for reserved seat Home Liner services. As a big fan of the classic JNR EMUs, this new design looks like a good modern twist on the original. I may have to pick up a model when they become available. Why does one car have a second pantagraph? Aha, that's "our" bridge at Mitaka. The other week I noticed sometimes the E233 train conductors would tootle the horn from the rear cab. Anyway I caught up with the M50 set at Shinjuku, though I barely had time to take some photos before it zipped back off the way it came. I reckon JR are running it up and down just for the hell of it and/or for the pleasure of railfains, as it was running as "回送" but the service was not displayed on the platform signs, and the interior clearly wasn't ready for service. Saw it again today also as "回送", presumably it was expected by the various toritetsu dotted around. 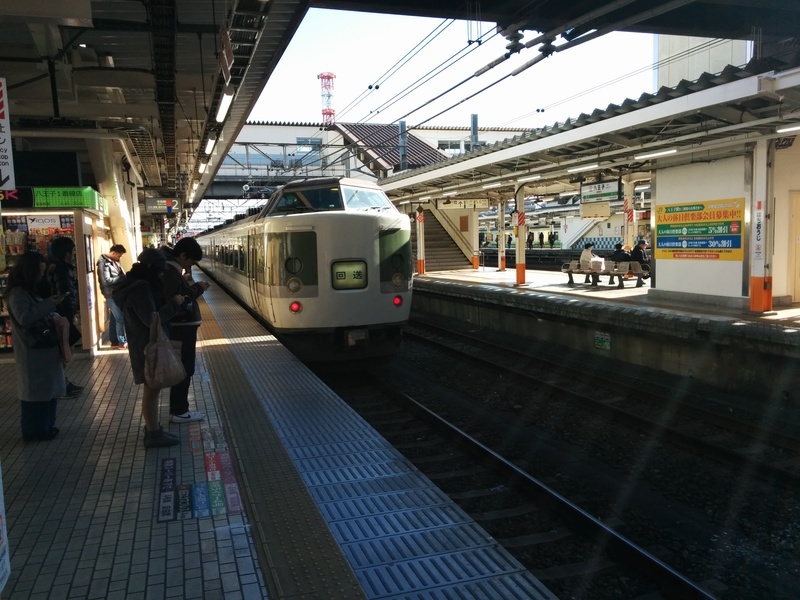 Ooh, and I also saw the Asama set at Hachioji, where the Squidlet and I were admiring some takis from the Yokohama line platform and just had time to squidhandle the Squidlet back to the Chuo line platform to see it pull away. Actually two cars, one motor car on each sub set. On DC only trains like these, they tend to be spares or a way to increase current pickup on steep slopes (the RhB Allegra uses both pantos only on the steepest DC section), while on some older AC/DC sets these were the AC pantorgraphs (often with a different profile). In this case it's not that clear though. This train has motor (cow-calf) groups of 2 cars, but equipment groups of 3 cars with mixed motor trailer groups. The 3 car booster set has a motor group of 3 cars with the center car having two pantographs feeding 3 motor cars. On the other sub set, the double pantograph car has a control trailer next to it and one motor car has a middle trailer as its equipment partner. No clear standalone car groups anywhere. Quite a mix compared to the common JNR practice of simple Mp-M' pairs. Also this series has 4 different and non interchangable cab car types. I see... definitely a nice bridge to visit! Those drivers are so kind to sound and wave! I didn't know the M50s were only used for special occasions... I thought they were used regularly for Holiday Rapid Fujisan Express and Holiday Rapid Kawaguchi-Ko Express... then my friend must have gotten so lucky riding it last year! The M50 is the specific set number. The 189s are presumably used on the various holiday services, excursions etc., TBH I haven't paid much attention, maybe I should find out while they're still around. More on the E351 scrapping--in the latest YouTube video from ichi pika, you see various E351 trainsets awaiting scrapping. Note they quickly scrapped the 485 Series NO.DO.KA trainset very quickly, and it appears the 189 Series M50 will soon be meeting the same fate. There was a short piece on NHK news the other week showing the M50 set leaving Toyoda on its way to Nagano. Well, that's it for Super Azusa services with the E351 series. Today was the last run, which happened sooner than I had expected. There will be a final "last run" special on April 7th, apparently. Do you know if the one on 7 April will be the last run for the E351 series altogether? Or can we still expect them to appear on special services for a while?